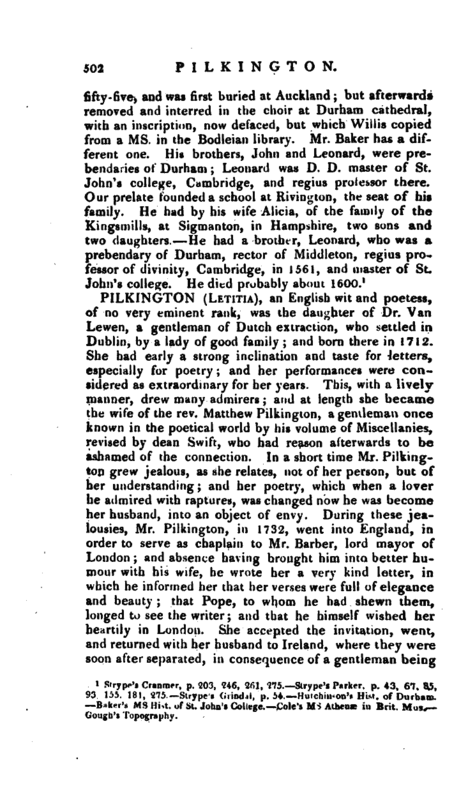 , a learned and pious English prelate, was the third son of Richard Pilkington of Riving-­ton, in the county of Lancaster, esq. 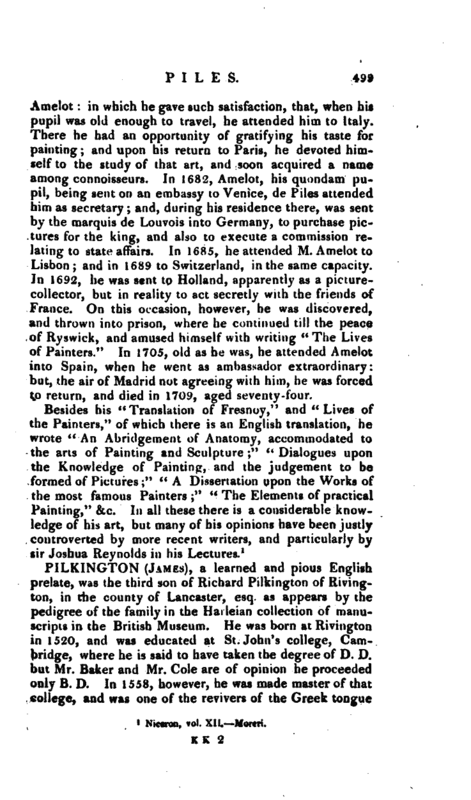 as appears by the pedigree of the family in the Harleian collection of manuscripts in the British Museum. He was born at Rivington in 1520, and was educated at St. John’s college, Cambridge, where he is said to have taken the degree of D. D. but Mr. Baker and Mr. Cole are of opinion he proceeded only B. D. In 1558, however, he was made master of that college, and was one of the revivers of the Greek tongue | in the university. Strype says that he was presented by Edward VI. to the vicarage of Kendal in Westmoreland. Tie was obliged to leave the country during the Marian persecution, and abroad he appears to have associated with the Geneva reformers, and imbibed their opinions as to externals. When he returned, he was made bishop of Durham by queen Elizabeth, Feb. 1560-1, a proof that he must have been distinguished for learning and abilities, as he appears always to have been for piety. In 1562 he is said to have been queen’s reader of divinity lectures. For this, Mr- Baker allows that he was well qualified, for besides that he bore a part in the disputation at the visitation of Cambridge, under king Edward, while Bucer was at Cambridge, he voluntarily read in public upon the Acts of the Apostles, and acquitted himself learnedly and piously. During this prelate’s time, not only the cause of religion, but also political matters, called the queen’s attention towards Scotland, and the borders were frequently the scene of military operations. During these commotions, the queen having seized the earl of Westmoreland’s estates within the bishopric of Durham, our prelate instituted his suit, in which it was determined, that “where he hath jura regalia (regal rights) he shall have forfeiture of high treason.” This being a case, says the historian of Durham, after the statute for restoring liberties to the crown, is materially worth the reader’s attention. By an act of Parliament, made in the 13th year of Elizabeth, 1570,c. 16. “The convictions, outlawries, and attainders of Charles Earl of. 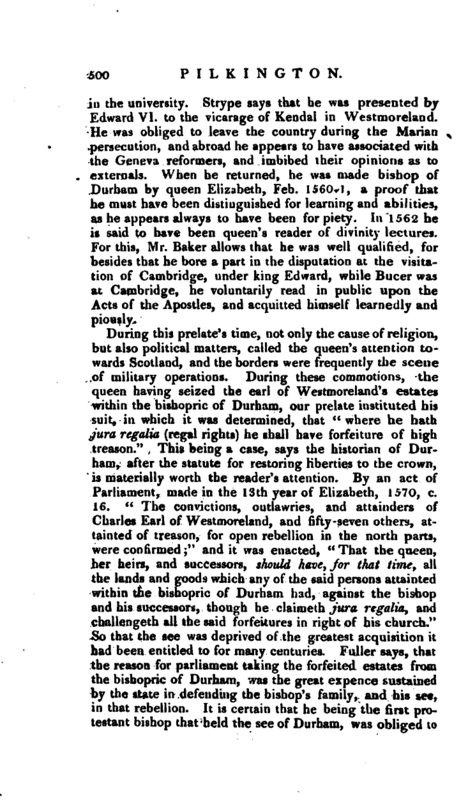 Westmoreland, and fifty -seven others, attainted of treason, for open rebellion in the north parts, were confirmed;” and it was enacted, “That the queen, her heirs, and successors, should have, Jor that time, all the lands and goods which any of the said persons attainted within the bishopric of Durham had, against the bishop and his successors, though be claimeth jura regalia, and challenged! all the said forfeitures in right of his church.” So that the see was deprived of the greatest acquisition it had been entitled to for many centuries. Fuller says, that the reason for parliament taking the forfeited estates from the bishopric of Durham, was the great expence sustained by the state in defending the bishop’s family, and his see, in that rebellion. It is certain that he being the first protestant bishop that held the see of Durham, was obliged to | keep out of the way of the insurgents, to whom a man of his principles must have been particularly obnoxious. Another reason assigned, that the bishop gave ten thousand pounds with one of his daughters in marriage, appears to have less foundation. Ten thousand pounds was sufficient for the dowry of a princess, and queen Elizabeth is said to have been olfended that a subject should bestow such a sum. Fuller, who has been quoted on this subject, has not been quoted fairly: he gives the story, but in his index calls it false, and refers to another part of his history, where we are told that the bishop gave only four thousand pounds with his daughter. 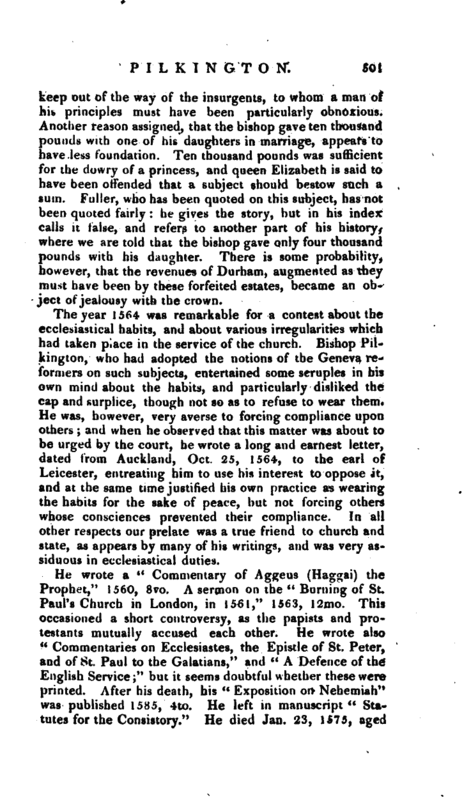 There is some probability, however, that the revenues of Durham, augmented as they must have been by these forfeited estates, became an object of jealousy with the crown. The year 1564 was remarkable for a contest about the ecclesiastical habits, and about various irregularities which had taken place in the service of the church. Bishop Pilkington, who had adopted the notions of the Geneva reformers on such subjects, entertained some scruples in his own mind about the habits, and particularly disliked the cap and surplice, though not so as to refuse to wear them. He was, however, very averse to forcing compliance upon others; and when he observed that this matter was about to be urged by the court, he wrote a long and earnest letter, dated from Auckland, Get 25, 1564, to the earl of Leicester, entreating him to use his interest to oppose it, and at the same time justified his own practice as we’aring the habits for the sake of peace, but not forcing others whose consciences prevented their compliance. In all other respects our prelate was a true friend to church and state, as appears by many of his writings, and was very assiduous in ecclesiastical duties. Strype’s Cranmer, p. 203, 246, 261, 275.—Strype’s Parker, p. 43, 67, 85, 93, 155, 181, 275.—Strype’s Grindal, p. 54—Hutchinson’s Hist. of Durham. —Baker’s ms Hist. of St. John’s College.—Cole’s ms Athenæ in Brit. Mus.— Gough’s Topography.